I like to end our workouts with a toughness drill. If the players have worked the way they should throughout the workout, they should be fatigued before starting this drill. 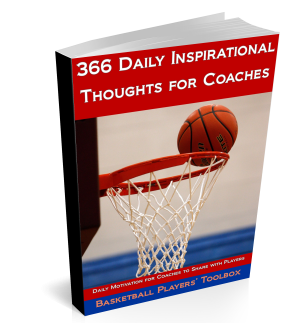 You can score it the best way that fits your players. You can time them and require that they make each shot (no matter how many attempts are needed to make each one), prior to moving onto the next shot. Or, you can time how long it takes them to shoot all 4 shots and add penalty seconds for the misses or subtract time for each make. It is a good way to end a workout. The contest is not open to beat Ganon, but you can certainly set up a contest to have your players compete against each other or themselves on the time that it takes them to make the 4 shots. The video is a You Tube video and the sound is not the best, so you might have to adjust your volume setting to hear his instructions.